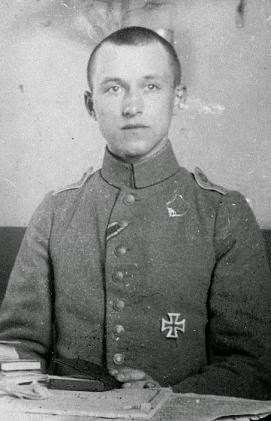 Ernst Jünger's name is usually associated with his masterpiece, the realistic account of his wartime experience entitled Storm of Steel (In Stahlgewittern, 1920), as well as his following literary representations of the Great War on the Western Front in Copse 125 (Das Wäldchen 125, 1925) and Fire and Blood (Feuer und Blut, 1925). And yet he’s one of the most problematic authors of the period, whose legacy constantly raises opposing reactions and judgments. It is almost impossible to form a clear opinion on his thinking, to frame his intricate biographical trajectory in defined historical, political and cultural streams. We simply run the risk to miss the point in trying to interpret Jünger’s meditations on World War One in the light of the following decades and of the Nazi Germany. Maybe it would be wise to give up any accusation and defense and simply recognize the complexity and above all the “otherness” of his cultural world in comparison to ours, especially when he praises the energies unleashed by the Great War as a heroic reaction to the European world-weariness and seems to turn into what scholars have often described as a “aesthetic of carnage”. This attitude could help us to face the sometimes unavoidable discomfort in reading some of Jünger’s works, as it is the case of the collection of essays appeared in 1934 with the title Blätter und Steine (Leaves and Stones), to which we direct the attention today. We invite to discover all the texts gathered in this collection, but particularly representative of Jünger’s literary output of the interwar period is the short writing entitled Total Mobilisation (Die totale Mobilmachung, first published in 1930; an English translation by Joel Golb and Richard Wolin in The Heidegger Controversy: A Critical Reader, edited by Richard Wolin), which resumes the arguments of his key-work Der Arbeiter (The worker, first published in 1932 as final reflection on his battlefield experience) and expresses the core of the ideals of the traditional German conservatism in opposition to the new revolutionary one. Die totale Mobilmachung is a difficult essay, which should be considered as part of a wider discussion including among others Heidegger’s essay “Questioning After Technology” or Benjamin’s “On the Origin of the Work of Art in the Age of Mechanical Reproduction”. It deserves therefore a more complex analysis, but we leave our readers to formulate their own interpretations of this work. Here we just invite to trust Jünger’s observation that this new and radical ideal of mass technological mobilization of the society probably «makes the World War a historical event superior in significance to the French Revolution», prefiguring the degeneration of European civilization into totalitarian systems.